This paradise of a getaway is located on the East Coast Road at Palavakkam. 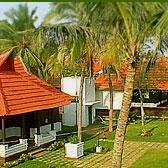 Designed like a heritage bungalow from Kerala, it is decorated with ornate woodwork, and houses 18 A/C rooms. There is a seafood specialty restaurant that serves authentic, southern delicacies from the state of Kerala. Guests can rejuvenate with an ayurvedic massage, or simply enjoy a dip in the pool. The tryst with Nature continues with a stroll on the landscaped path amid coconut palm grooves.